Two things that have made me happy in 2010, so far. 1. I have won a Tote bag from Foodieblogroll. Yes!, I won. This is the first gift my blog has received.I will take a photo & display it in my next post. 2. TOFA from Ashkuku. Thanks a lot Asha. I will write about it too, in my next post. Mom-in-law: You prepare guliyappa very well, why don't you prepare that? Me: Aunty, what shall I prepare for tomorrow's evening snack? Aunty: If you could prepare guliyappa, we all will be very happy. 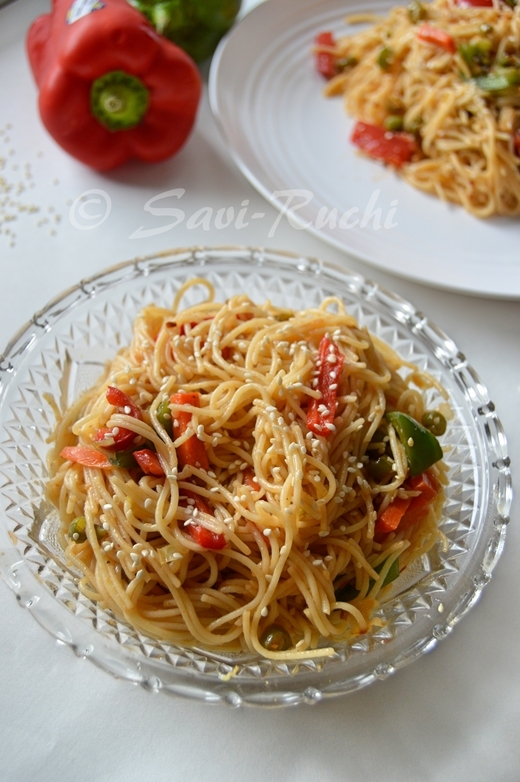 After many such conversations, I have now realized that kusubalakki guliyappa is my signature dish. 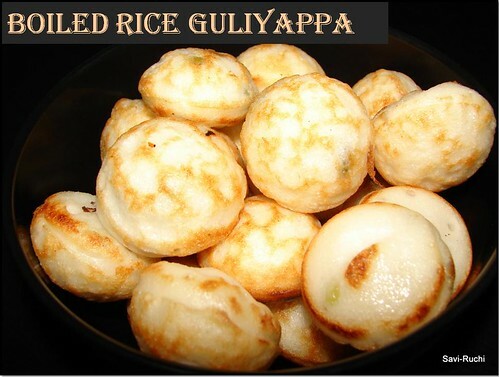 Be it my granny, my in-laws, my friends or my hubby's friends, everybody likes to eat this particular version of guliyappa(rice balls). This dish doesnot call for more than two ingredients (yes you read it right.., no more than 2.., ofcourse excluding salt) & tastes heaven. 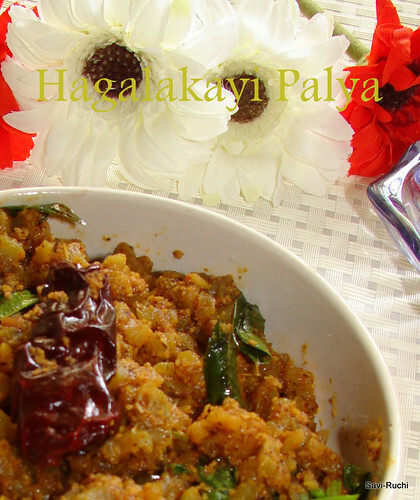 This recipe gives you some of the most soft guliyappas, you have tasted ever. Try it to believe!! Oil: few drops on each mould. Soak the rice & dal in double the amount of water for 6-8hours. Grind the rice-dal mixture in the blender & prepare a smooth batter. Batter should be like a thick milkshake. Let the batter ferment over-night or for about 8-10hours. Batter would be doubled by then. Add salt to the batter & mix well. Heat the guliyappa pan/aebliskever pan. When the pan is hot, add few drops of oil to each mould. Pour 2 tbsps(approximately) of batter to each mould & cook it on a medium heat for a minute. Turn the balls & cook on the other side too. Serve it hot with a chutney/curry of your choice. 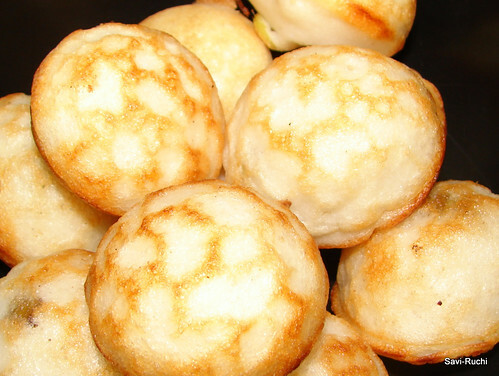 If boiled rice is not available, parboiled idli rice can also be used. As soon as the rice balls turn golden & slightly brown, remove it from the pan. Ensure to cook the rice balls on a medium heat. Donot use high flame as the guliyappa may not be cooked from inside. We had to pass through Charmadi Ghats (curvy roads on the western ghats) & my son puked at almost all the curves. He got so frustrated seeing the car that he was weeping & saying, " amma car beda amma" (mummy, no car please). But, after we reached this place, he slowly settled down & was happy to play with the other kids. I thoroughly relished South Canara food as we attended 2 weddings & also spent some good time with hubby's relatives. We also took blessings from Sringeri Sharadambe, Kateel Durgaparameshwari, Kelamata Venugopalaswamy, Someshwar Ganapathi, Durga (I have spoken about that here) & safely reached my native. Will continue later on this. It was raining avrekayi during my visit to India this time. Now that my mom & mom-in-law knows that we do not get avrekayi here, they drenched us with this. 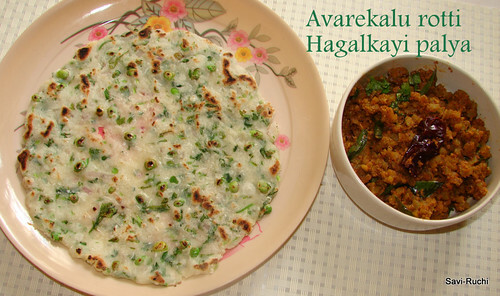 I had avrekayi upma, avrekayi rotti (flat bread), avrekayi palya (stir fry) & what not!! 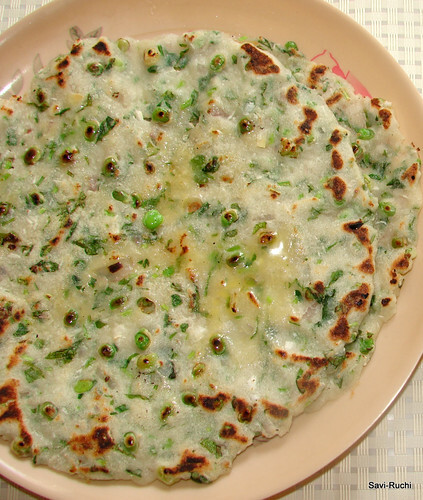 In this post, I will be talking about avrekayi rotti (Flat beans Indian bread). Just dive in !! Mix all the above ingredients (except water). Add little water at a time & prepare soft & smooth dough. Make equal sized balls & pat them on the griddle or a plastic sheet & transfer it to the griddle. (refer here for step-by step procedure). Wet your hands with water to ease the patting. Add oil around the rotti & also few drops on top of the rotti. Cook on a medium-high heat on both sides & serve it hot with a side dish of your choice. If the flat beans is not tender enough, pressure-cook them for one or two whistles and then use it. You can substitute fenugreek leaves with any other leafy vegetables. Mix a tsp of salt & turmeric to the bitter gourd pieces & allow it to leave water for 20-30mins. Squeeze the water from th bittergourd &discard the water. This procedure is said to reduce the bitterness in the gourd. Heat a broad pan, add oil. When oil is hot, add mustard seeds. When mustard seeds crackle, add curry leaves, asafetida, urad dal, broken red chilli & saute for 10secs. Add the bitter gourd & mix well. Allow the bitter gourd to get cooked for 5mins. Meantime, make a coarse powder of the coconut & the rasam powder(Do not add water). Once the bitter gourd is half cooked, add the tamarind powder, salt (note salt is added before too), jaggery, the prepared coarse powder & mix well. Cook for another 5-7mins. 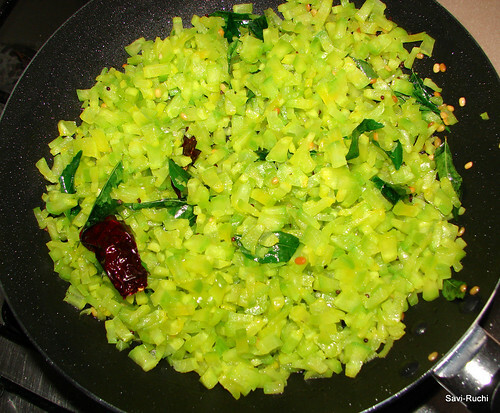 Turn off the flame, garnesh with coriander leaves/cilantro & serve with rice or roti. Chinese bittermelon oozes out a lot of water while cooking. Hence, there is no need to add water while cooking. However, Indian bittergourd might need few teaspoons of water. The palya is supposed to be dry. So, donot make the tamarind paste or spice paste/powder watery.